For details about print quality, guarantee, paper types, etc, click here. 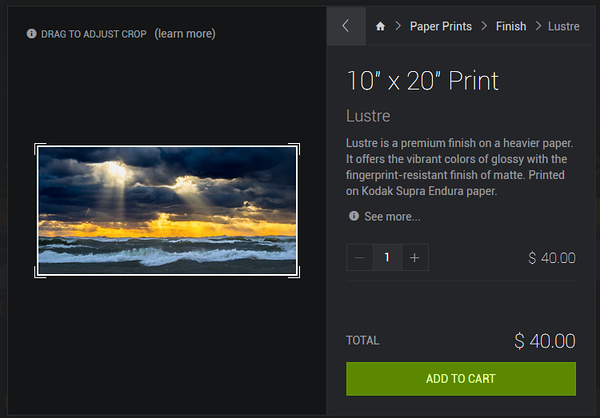 Ordering prints online is simple and quick. Purchased items do NOT have the "Mike Dixon Photography" watermark on them. 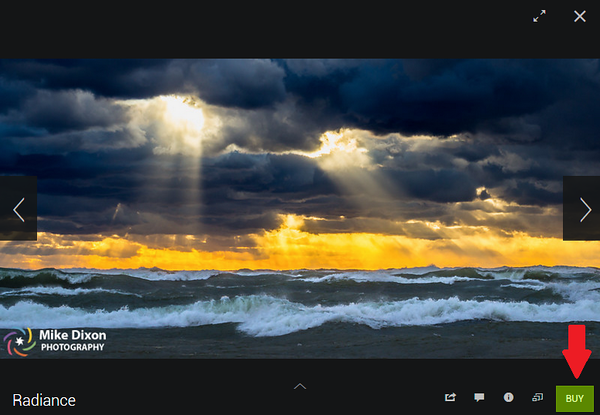 First, in the gallery listing there will be a "Buy Photos" button above the image, or if you're viewing the image full size, there will be a "Buy" button below the image. 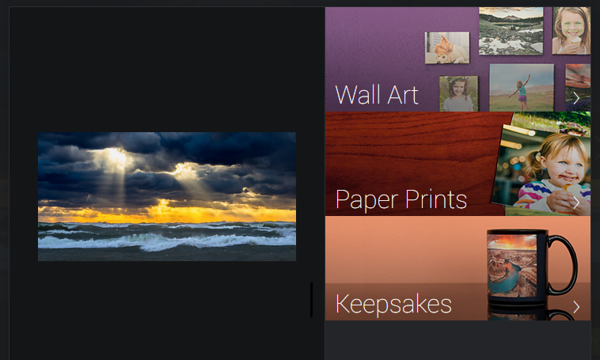 When you click that you will be presented with a list of options, choose "This Photo" to by a single photo, or select "Photos from this Gallery" to select multiple photos. Next, select the type of item you wish to buy. Wall Art contains Canvas and Metal Prints. 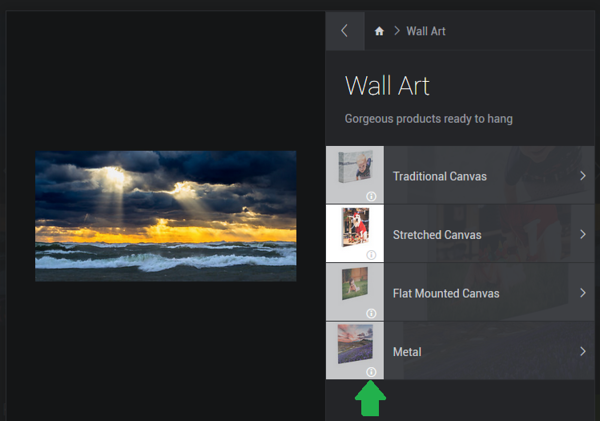 If Wall Art, is chosen there will be an "i" image on each item that you can click, this will show more information about the item as show with the green arrow below. You can use the arrow "<" to go back a step at any time. 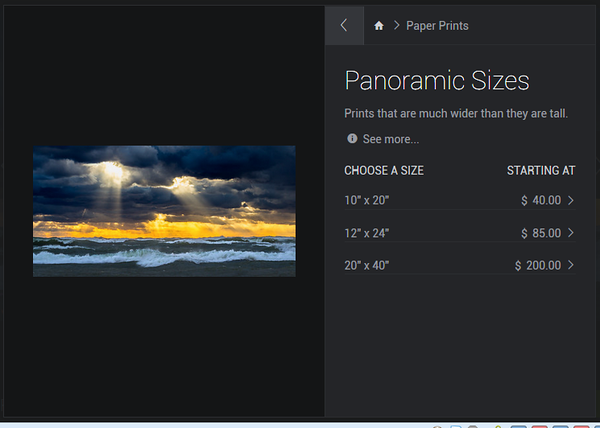 Next you can select the size you want or click the "See More" for more information. Wide images have fewer size options than standard image sizes. Next, select a finish. Click "See more" to read more about the finishes. Once you select a finish, you will be presented with screen to choose the crop and how many copies you want. 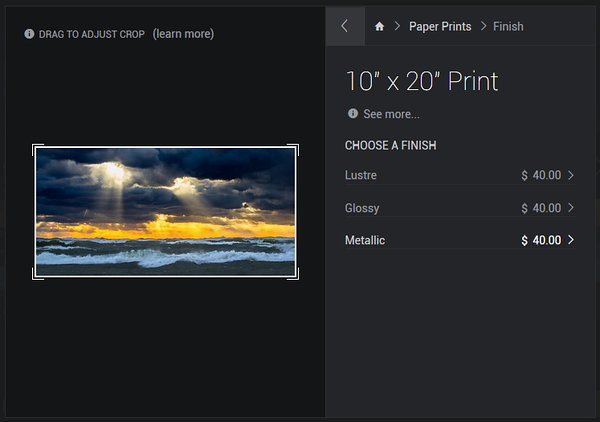 Cropping allows you to select the part of the image to put on the print for sizes that are of a different proportion than the original image. 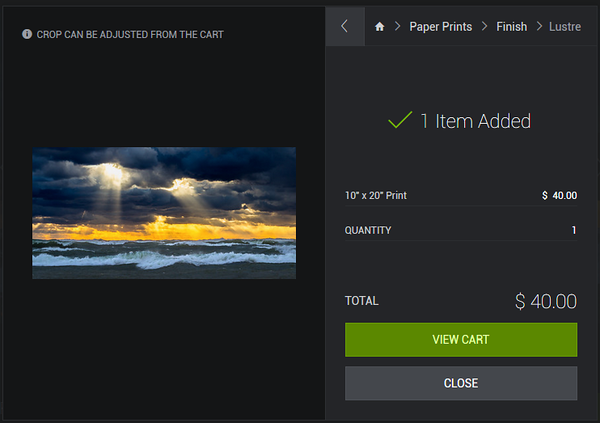 You can also crop from the shopping cart. When ready, select "ADD TO CART" to add it to your shopping cart. Once the item is added to the cart you will see the following screen. Select "VIEW CART" to immediately go to the cart to view it or check out, or select "CLOSE" to go back to the gallery. To check out after returning to the gallery, click the shopping cart in the upper right corner of the website. + Adjust the crop of the image. + Click "Continue Browsing" to be returned to the website to add more photos before checking out.